Principal Stevens and Melanie Smith from the Sing For Hope Organization with PS4 students, teachers and PTA Pres. 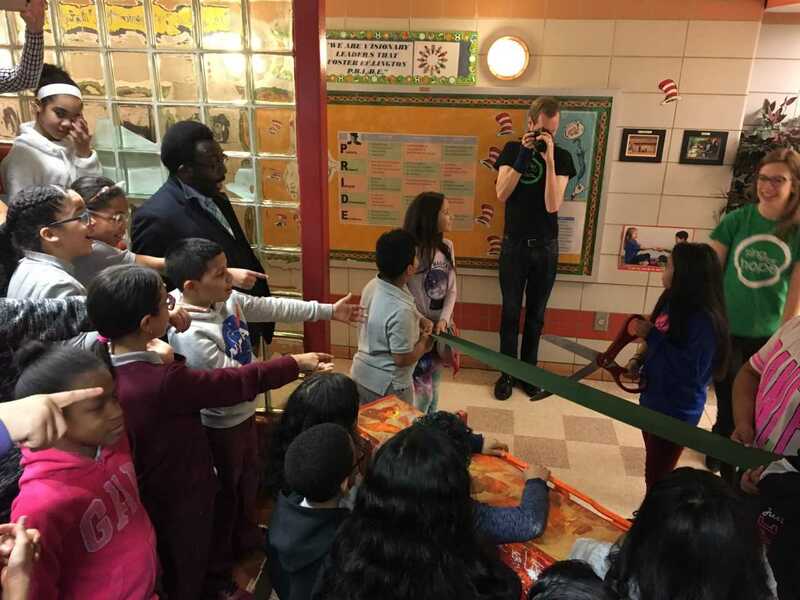 The Sing For Hope Piano, located in our school's lobby, received an official welcome by members of the Student Government Organization, The Ellington Poets, Principal Stevens and representatives from the Sing For Hope Organization. 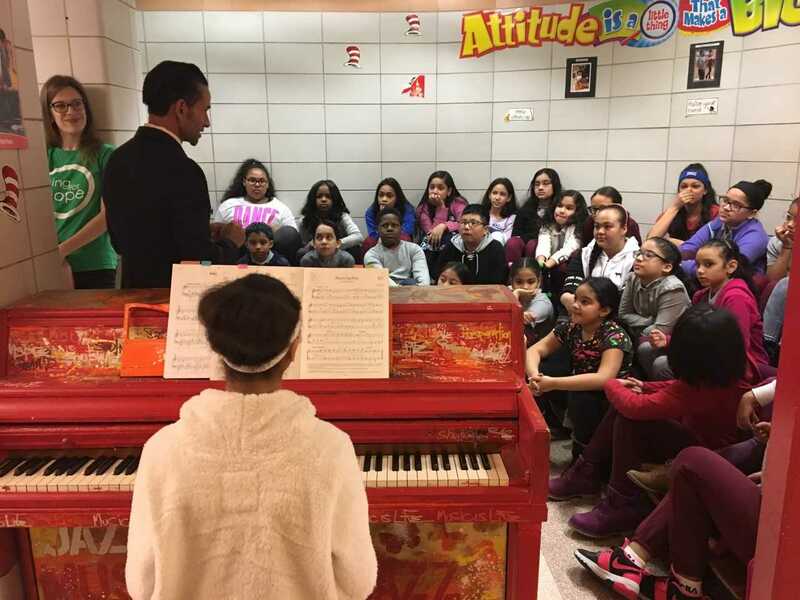 During this much anticipated celebration, Melanie Smith, Youth Programs Manager at Sing For Hope, gave students information about the organization and the history of our piano. "Your piano", she told students "came all the way from under the arch at Grand Army Plaza in Brooklyn and was painted by an artist named Lance Johnson". 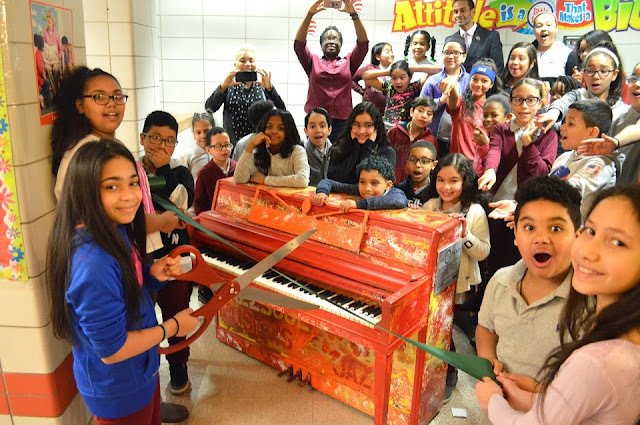 This piano is perfect for our school because the artist, from NYC, was inspired by jazz music and wanted to visually express the improvisational creativity of the music. To learn more about is artwork, click here! During this celebration of the arts, Ms. Williams' (Assistant Principal) daughter Maddie played a song on the piano, Sing For Hope Volunteer John Clinton engaged students in a sing along and our very own Ellington Poets performed an excerpt from their poem, Hamlet in the Heights. 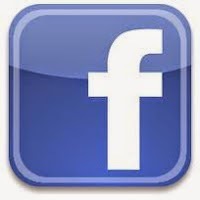 To learn more about the Sing For Hope Organization and how they celebrate the arts, click here! For more highlights from the event, click here, watch the video and take a look at the photos below! Special thanks to Melanie Smith and John Clinton from Sing For Hope for leading our ribbon cutting ceremony! 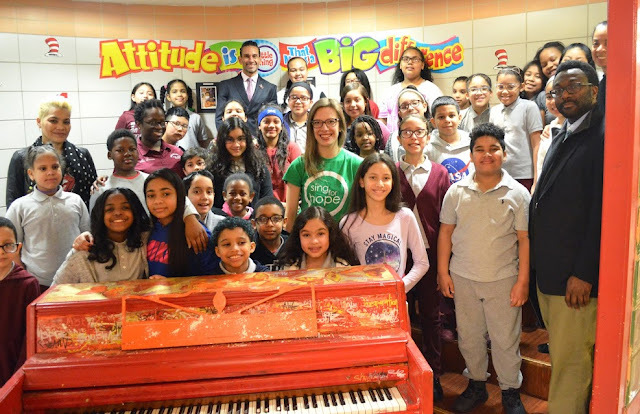 Thanks to Mr. Cantu, Arts Coordinator, for leading arts in our school and bringing this special piano to our lobby. Take A Tour of PS4!